Finding a place to eat at Walt Disney World when you’re hungry and tired, the kids are cranky and it’s 88 degrees outside can be tough and stressful. Combine that with over-excitement, crowds, long lines and too many choices, and “melt down” only begins to describe the experience! Adding to the stress: the restaurants at Disney World are now so busy that you must have Advance Dining Reservations if you want to eat in many of them. In fact, in some cases you’ll have to book 6 months in advance in order to get a table! In light of all that, we strongly recommend deciding where you want to eat and making reservations well in advance of your vacation. But how do you pick restaurants before you’ve even arrived in Orlando? One great resource is The Disney Food Blog, which offers in-depth news and information about dining in Disney’s parks, resorts, and cruise ships, along with reviews and mouth-watering photographs of just about anything food-related at Disney. 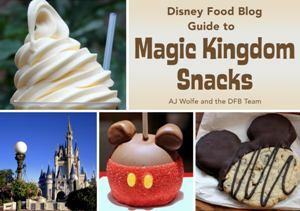 The author and founder of The Disney Food Blog, AJ Wolfe, has compiled her best material about all things delicious at Walt Disney World into critically acclaimed, comprehensive e-Books that cover many different aspects of Walt Disney World dining. While her blog is great, we think her e-Books are even better! MouseSavers.com readers get 20% off any Disney Food Blog e-Book, or buy a “bundle” of multiple e-Books and get 30% off! Not sure you’ll like the e-Books? Go ahead and try them with no risk: there is a 30-day money-back guarantee! If you’re not 100% satisfied, just send AJ Wolfe an email and she’ll refund your money, no questions asked. The Disney Food Blog Guide to Dining at Walt Disney World is stunningly illustrated and amazingly informative. This annually updated guide can help you save time, money and hassles. You’ll learn what snack and meal choices are available at Walt Disney World, before you go. It also provides excellent planning tools, plus useful tips and tricks that you just can’t find in one place anywhere else. There are several e-Book guides (The Disney Food Blog Guide to Epcot Snacks and The Disney Food Blog Guide to Magic Kingdom Snacks and The Disney Food Blog Guide to Animal Kingdom and Hollywood Studios Snacks) with detailed descriptions and photos of many of the best snacks available at Epcot, Magic Kingdom, Animal Kingdom and Hollywood Studios. These guides are especially useful if you will be on one of the Disney Dining Plans and are wondering about the best use of your snack credits. You’ll even learn how to make a meal out of leftover snack credits! In addition, there are special annual guides to two of the most exciting times to visit Walt Disney World, especially if you love to eat: The Disney Food Blog Guide to the Epcot International Food & Wine Festival and The Disney Food Blog Guide to the Walt Disney World Holidays. These two e-Books can help you have an amazing trip during Food & Wine or the holidays, and you’ll love the lip-smacking photos of special treats that are available only for a limited time each year! 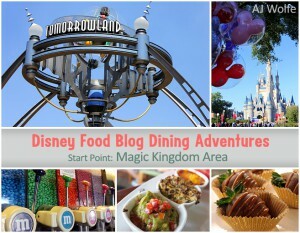 Last but not least, there’s a clever guide called Disney Food Blog Dining Adventures, which plans your days at Disney World for you! You pick the number of days you’ll be visiting the theme parks, and the guide suggests themed plans outlining your day from breakfast through dinner, with ride suggestions and snacks that compliment each adventure. MouseSavers.com Readers Save at Least 20% on Any Disney Food Blog e-Book! Get at least 20% off when you order any individual Disney Food Blog e-Book! Learn about ordering a bundle — save 30%! 30-day money-back guarantee! If you’re not 100% satisfied, just send AJ Wolfe an email and she’ll refund your money, no questions asked. 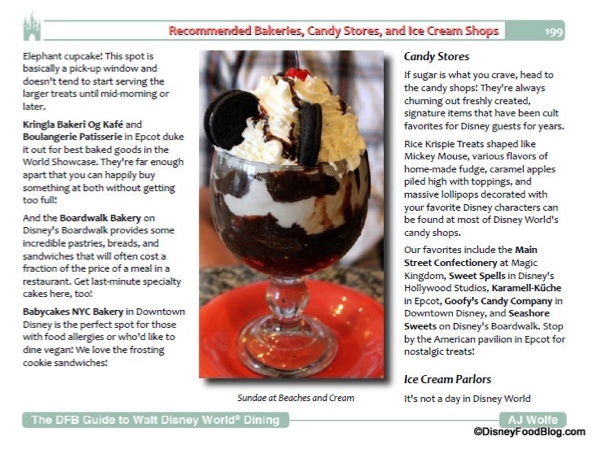 The Disney Food Blog Guide to Dining at Walt Disney World is a beautifully photographed and comprehensive e-Book that does a fantastic job of explaining the dining options offered in the parks and resorts, and describing the ambiance of the restaurant locations. It provides well-researched, up-to-date information and helps you find the food experiences that you and your family will enjoy. If you’ve never been to Walt Disney World and have no idea of where or what you want to eat, this guide is ideal. It provides all the details that will help you choose the right eateries to enhance your Disney vacation. For Walt Disney World veterans, The Disney Food Blog Guide to Dining at Walt Disney World is a joy to read and surprisingly helpful. The photos will make your mouth water, and you’ll probably learn something new every few pages. We certainly did! We are dedicated eaters and have been to almost all of the over 200 restaurants at least once, yet this book taught us a lot. If you love to eat, you’ll love this book, with its drool-worthy photos of delicious dining options. The hard part is deciding how many of Disney’s amazing taste treats you can cram into one trip! This book will help you sort them out and find the places that will be perfect for your own personal preferences. Not a “foodie”? Even if you’re mainly going to Disney World for the rides, you have to eat, and if you don’t know what you’re doing, dining at Disney can be time-consuming and expensive. This book can help you pick places to eat yummy food as economically and quickly as possible, so you can head back to the attractions happy and satisfied. Prefer NOT to plan ahead and want to “wing it” on your dining plans? This guide can help you, too, by suggesting the best places to go when you don’t have reservations. In short, no matter who you are or how you feel about food, this book will help you create dining experiences that you and your family and friends will enjoy and remember. Know what your all of your dining options will be in each of the various parks, including meals, snacks and drinks! Decide where to go and know what to expect from your choices before you go. Find and design meals and snacks to fit your budget. Know when and how to make Advance Dining Reservations, so you can save time and avoid disappointment. Maximize use of your Disney Dining Plan options. Find gluten free, vegetarian, vegan, and other special diet foods in Disney! Updated recommendations for traveling with babies and toddlers. Whether you’ve been to Walt Disney World before or not, whether you’re on a Dining Plan or not, The Disney Food Blog Guide to Dining at Walt Disney World can help you make dining a fun and hassle-free part of your vacation. And because it’s an e-Book, you can quickly search for any information you want. Plus, you can load it on your smart phone or tablet and carry it with you! MouseSavers.com Readers Save More Than 20% on The Disney Food Blog Guide to Walt Disney World Dining! Learn about ordering this book as part of a bundle — save 30%! Epcot is known for foods from around the world, and with more than 35 restaurants and 20 food carts in just that one park, it’s critical that you know which countries’ culinary delights you’d like to explore. Of course you also want to get the best value for your dollar — and for your Dining Plan Snack Credits! With The Disney Food Blog Guide to Epcot Snacks e-Book, you’ll have access to photos, reviews, and prices for over 150 individual snacks in Epcot. Because it’s an e-Book, you can quickly search for any information you want. Plus, you can load it on your smart phone or tablet and carry it with you! Best Snack Credit values – if you’ll be on a Disney Dining Plan, get the biggest bang for your buck. Suggested snack pairings – like wine pairings but with food! “Snack Meals” – a few delicious suggestions for snack-only meals. 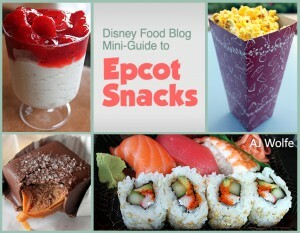 MouseSavers.com Readers Get a 20% Discount on The Disney Food Blog Guide to Epcot Snacks! Revised and updated in 2017, The Disney Food Blog Guide to Magic Kingdom Snacks e-Book gives you access to photos, reviews, and prices for over 180 individual snacks in the Magic Kingdom. For those who will be taking kids, this book is a fun way to pre-plan some of the yummy treats you can enjoy with them during your visit to the Magic Kingdom. If you’re on a Disney Dining Plan, this book is invaluable, because it helps you find the best Snack Credit values in the park! This handy guide includes current prices and Disney Dining Plan snack credit status. Suggested “Snack Pairings” – sometimes two snacks together are better than one! Snack Location Index – a clickable index organized by Magic Kingdom “land,” detailing the location of each snack and whether or not it’s available for a snack credit. MouseSavers.com Readers Get a 20% Discount on The Disney Food Blog Guide to Magic Kingdom Snacks! 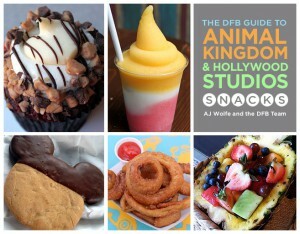 The Disney Food Blog Guide to Animal Kingdom and Hollywood Studios Snacks e-Book gives you access to photos, reviews, and prices for over 200 individual snacks in Disney’s Hollywood Studios and Animal Kingdom. If you’re on a Disney Dining Plan, this book is invaluable, because it helps you find the best Snack Credit values in the park. There are plenty of fantastic snacks valued at over $4 that you can get in exchange for just one snack credit! 8 different themed Snack Crawls — a great activity for a group of any size or a solo adventurer! Suggested “Snack Pairings” – for those who want to combine sweet and salty or play with textures and flavor! Snack Meals – a few delicious suggestions for snack-only meals! MouseSavers.com Readers Get a 20% Discount on The Disney Food Blog Guide to Animal Kingdom and Hollywood Studios Snacks! This little guide offers a unique concept: pre-planned fun at Walt Disney World, organized around a theme! It’s like having a personal tour guide who knows just what you like. 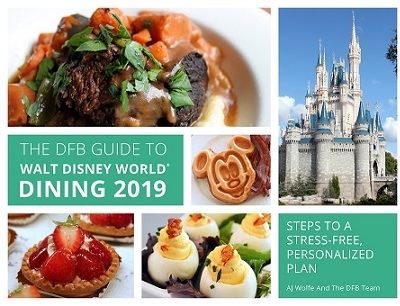 Pick themes that interest you, and based on how long you’ll be spending in the parks, the guide will provide detailed plans for a variety of perfect days, including meals and snacks! There are more than 20 different one-day adventures you can choose from, and lots more multi-day plans. Since it’s an e-Book, you can load it on your smart phone or tablet and carry it with you! Fully themed strategies that cover one day, two days, or a full week! Themed breakfast, lunch, and dinner suggestions. Disney attraction and ride suggestions that complement each Adventure theme. Favorite snacks that are within easy access during each Adventure. Historical and behind-the-scenes tips and details that make the Adventure come alive! MouseSavers Get a 20% Discount on The Disney Food Blog Dining Adventures! Each spring, typically early March through the first week of June, Walt Disney World hosts the Epcot International Flower and Garden Festival. During the festival, Disney punches up their landscaping at Epcot with additional topiaries, display gardens, wildlife habitats (including a butterfly garden) as well as offering some special tours. Outdoor Kitchens feature foods & beverages from the garden and grill, and Garden Rocks concerts, featuring popular bands, take place nightly. Full schedule of daily events. Printable Outdoor Kitchens Booth Menu Checklist to carry with you as you Eat around the World! Menus and Photos from Every Outdoor Kitchen — Plan ahead and be sure you know where you want to spend your vacation dollars by checking out what the menus and food items look like at the 15 Outdoor Kitchens! Be strategic with your time and money by using this great resource. Best of all, because it’s an e-Book, you can quickly search for any information you want. Plus, you can load it on your smart phone or tablet and carry it with you! 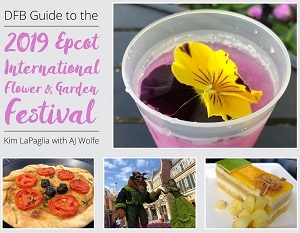 MouseSavers.com Readers Get a 20% Discount on The Disney Food Blog Guide to the Epcot International Flower & Garden Festival! Each fall, typically September through the second week of November, Walt Disney World hosts the Epcot International Food and Wine Festival, a several-weeks-long celebration that includes booths serving tasting portions of treats from around the world, as well as food and wine pairings, specialty dinners, Party for the Senses, culinary demonstrations and wine/beverage seminars. The Epcot International Food and Wine Festival is the biggest Food and Wine Festival of its kind in the world. It can be overwhelming, but with a bit of pre-planning you’ll be able to determine what events, demonstrations, and menu items are most important to you and your family, and create a strategy to make sure you experience them. Menus and photos from every World Showcase booth – check out what the menus and food items look like. Themed “Booth Crawls” – there is even a booth crawl designed for kids! Customized touring strategies, with suggestions and recommendations to maximize your time. MouseSavers.com Readers Get a 20% Discount on The Disney Food Blog Guide to the Epcot International Food & Wine Festival! 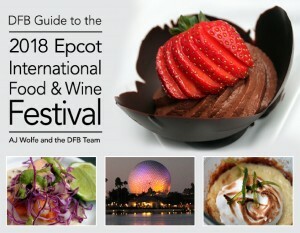 Get 20% off when you pre-order The Disney Food Blog Guide to the 2019 Epcot International Food & Wine Festival e-Book! (Regularly $14.95, your cost $11.95!) You’ll get the 2018 e-Book with your order, so that you can preview the book AND you’ll receive the 2019 book as soon as it’s published. You can find out a lot about holiday festivals and special events and parties at Disney here on MouseSavers.com, but if you want to learn more about all the details of experiencing the holidays at Disney — particularly the special food treats and amazing gingerbread displays — The Disney Food Blog Guide to the Walt Disney World Holidays e-Book is a great resource. The e-Book includes over 200 pages of gorgeous photos and in-depth information, including significant crowd-avoiding tips and information on where to dine when the restaurants are booked solid. If you’ve toured Walt Disney World during the busy holiday season, you know how important those details are! 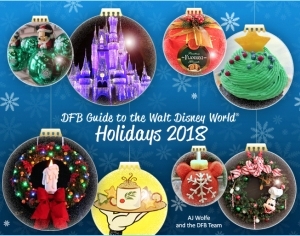 The Disney Food Blog Guide to the Walt Disney World Holidays includes all of the restaurants offering special meals or menu items, information on new or special time-limited shows, and a FAQ section and fun bonus items, including holiday-inspired “crawls” and touring strategies. Make sure you don’t miss one memorable holiday moment! By pre-planning, you’ll be able to choose the events, shows, activities and meals that are most important to you and create a strategy to make sure you experience them all. The Disney Food Blog Guide to the Walt Disney World Holidays includes all of the new elements that you’ll find at Mickey’s Very Merry Christmas Party, Osborne Family Spectacle of Dancing Lights, and the Candlelight Processional. MouseSavers.com Readers Get a 20% Discount on The Disney Food Blog Guide to the Walt Disney World Holidays! Get 20% off when you pre-order The Disney Food Blog Guide to the Walt Disney World Holidays 2019 e-Book! (Regularly $14.95, your cost $11.95!) You’ll get the 2018 e-Book with your order, so that you can preview the book AND you’ll receive the 2019 book as soon as it’s published (estimated release date: October 2019). You’ll get the best value for your dollar by purchasing “bundles” that include multiple Disney Food Blog e-Books. That way, you can truly “save a bundle” — 30%, in fact! One of the most popular bundles includes the main guide, The Disney Food Blog Guide to Dining at Walt Disney World, plus the three snack guides, The Disney Food Blog Guide to Epcot Snacks, The Disney Food Blog Guide to Magic Kingdom Snacks, and The Disney Food Blog Guide to Animal Kingdom and Hollywood Studios Snacks. There are other great bundles, too. Order Disney Food Blog Guide e-Book bundles at 30% off!